The perfect insert for the perfect diaper. 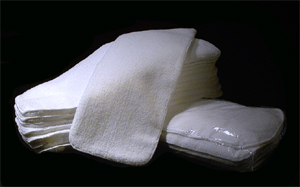 Microfiber inserts are made from 4 layers of super soft, incredibly absorbent microfiber. They are trim and thin yet can hold a large amount of fluid in each insert! We recommend additional inserts for heavy wetters or for nap times or long outings.